The abortion rate in the United States has been on a steady decline in recent years for a number of reasons, but a new study from the Centers for Disease Control and Prevention highlights just how much economic hardship affects a woman's decision to use birth control, have an abortion or carry a pregnancy to term. According the study, published last Friday, the U.S. abortion rate dropped to a historic low in 2011: 13.9 per 1,000 women, amounting to a ratio of 219 abortions per 1,000 live births. 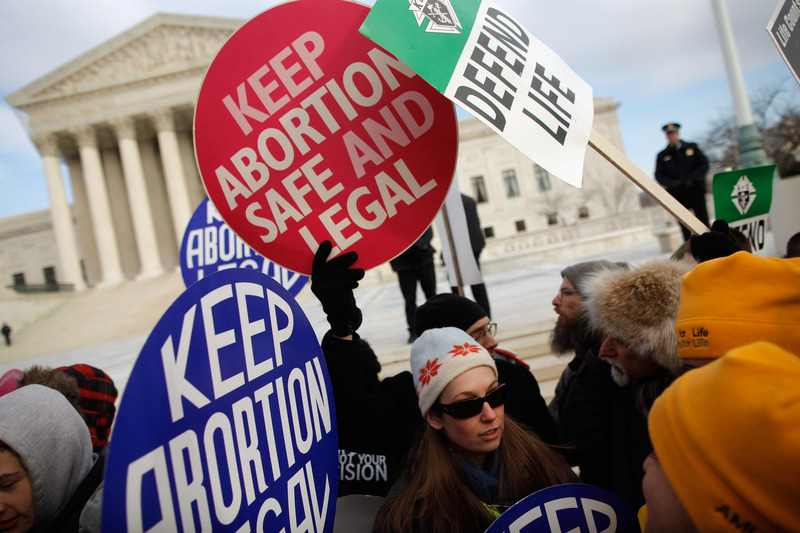 It's the lowest incidence of abortion America has seen — even lower than 1973, the year the Supreme Court ruled abortion was a constitutionally protected right. Roughly 730,000 abortions were performed in the United States in 2011, representing just a slight drop from the 765,000 procedures performed in 2010. Between 2002 and 2011, the abortion rate decreased by 14 percent, reflecting a changing landscape that now includes increased regulation, longer waits and, of course, a crippling recession that hasn't fully recovered. When looking at who has abortions, the researchers found that little went unchanged. The majority of women who have abortions continued to be in their 20s, representing 57.8 percent of abortion patients. Nearly 25 percent of abortion patients were women in their 30s, while women over 40 accounted for just 3.6 percent of abortions in 2011. However, it's worth noting a fairly new trend: The abortion rate for women in their 20s, particularly between the ages of 20 and 24, decreased by about 20 percent in recent years, and the rate for women in their 40s increased by eight percent. Adolescent women, between the ages of 15 and 19, also had a considerable decrease. The researchers found the abortion rate in that age group dropped by 34 percent, a decline that likely reflects the drastic drops in teen pregnancy, which most health researchers and experts attribute to increased awareness of effective birth control methods. Moreover, the use of early medical abortion has continued to rise since FDA approval of mifepristone: from 2002 to 2011, the percentage of all reported abortions accounted for by this method increased approximately 200%, with large increases observed both from 2002 to 2006 and 2007 to 2011. Because the annual increase from 2010 to 2011 was smaller than in previous years, continued surveillance is needed to monitor the use of early medical abortion relative to other abortion methods. So, is the abortion rate dropping solely because of the clinic closures in states across the South and the Midwest? Not entirely, although the state-by-state stats do show that states with only one or two abortion clinics have some of the lowest abortion rates in the nation. However, researchers believe the historically low rate is the direct result of birth control and the recession, the latter of which forced many American women to change their fertility plans. According to the CDC, women may be using increased birth control protection, or more effective methods, to delay childbearing until their economic situations are stable. The decline in abortions coincided with a steep national drop in overall pregnancy and birth rates. Contraceptive use improved during this period, as more women and couples were using highly effective long-acting reversible contraceptive methods, such as the IUD. Moreover, the recent recession led many women and couples to want to avoid or delay pregnancy and childbearing.